Active monitors may be the de facto standard in the studio, but this stylish Finnish design makes a powerful case for the alternative! Back in the May 2015 issue I reviewed the Amphion One15 and One18 passive nearfield monitors and, partly for their classy and understated aesthetic, but mostly for their well thought-out electro-acoustic design and well-balanced and musically informative performance, I really admired them. Quite a few nearfield monitors have flowed under the bridge since then and one of them, the PreSonus Eris MTM (SOS September 2016), was interesting partly because its mid-tweeter-mid driver layout (otherwise known as MTM or D’Appolito format) resulted in noticeable subjective changes depending on whether the monitors were used in landscape or portrait orientation. So, while it seemed like a good time to have a look at one of the larger and more ambitious models in the Amphion range, I was also interested to see if its MTM driver layout also resulted in the dispersion-based subjective phenomena that I found on the PreSonus monitors. Before I get on to describing the Amphion Two15, however, perhaps a short recap on the MTM driver format and its implications is appropriate. So here goes. As low-frequency bandwidth and maximum level aspirations for a moving-coil speaker increase, there’s no alternative but to have more diaphragm area: a bigger bass/mid driver, in other words. However, bigger bass/mid drivers quickly become compromised with rising frequency as the acceleration required of the diaphragm overcomes its material stiffness. Driver dispersion narrows too as the radiated wavelength approaches the diaphragm diameter. So increasing the size of a single bass/mid driver in a two-way system fundamentally results in problems. One way of overcoming the problems is to use two smaller drivers rather than one big one (it doubles thermal power handling too, but then it also doubles cost), and if you go down that route, locating the drivers in MTM format, with one bass/mid driver either side of the HF driver, also enables the speaker’s vertical dispersion (in portrait mode) to be symmetrical, rather than skewed as it is in conventional two-driver systems. Along with making the vertical dispersion symmetrical, however, the MTM format also tends to narrow the dispersion because, away from the central axis, phase differences between the two bass/mid drivers result in destructive interference. This dispersion narrowing can reach down in frequency significantly lower than the natural dispersion narrowing due to the diameter of the diaphragms, and is simply a result of geometry. I’ve illustrated it in Diagram 1. Off the central axis, differences in path length from each driver to the listening position result in phase changes and destructive interference between the driver outputs. Diagram 2 reveals the real-world effect of the geometry by showing a comparison of the portrait-orientation axial response, 40-degree horizontal off-axis response, and 40-degree vertical off-axis response of the Amphion Two15, taken using FuzzMeasure Pro. The horizontal response is well controlled with the output gently falling as frequency rises. The 40-degree vertical response, however, shows very clearly that, even as low as 500Hz, destructive interference between the two bass/mid drivers results in a reduction in output. The same phenomenon was apparent with the PreSonus Eris MTM monitors, so I would expect the Amphion Two15 to display the same characteristic difference in its subjective performance when used in either landscape or portrait orientation. Before we see if it does, however, it’s back to a little more general description. Diagram 1: The off-axis geometry of a D’Appolito or MTM-type speaker. As with the previous two Amphion models I reviewed, the Two15, to my eyes, unmistakably displays its Scandinavian roots through crisp and stylish industrial design. The textured dark grey of its internally braced enclosure panels contrasts with the aluminium diaphragms of its 15cm bass/mid drivers and the white of its HF driver ‘waveguide’ to create a decidedly classy look. Unlike the previous two Amphions, however, and thanks to its MTM driver layout, the Two15 is decidedly tall and slim — although not to the extent that there were any problems installing a pair either side of my DAW. The Two15 bass/mid drivers are sourced from SEAS, a specialist Norwegian OEM manufacturer, and if my experience of their drivers is anything to go by, they will be of extremely high performance and quality. The metal-dome HF driver is also, I believe, a SEAS unit, but is less easy to identify, nestling at the apex of its ‘waveguide’ (more conventionally known as a ‘horn’). Diagram 2: The on-axis response (green), and 40-degree vertical (purple) and horizontal (orange) off-axis responses of the Two15 in portrait orientation. Being a passive monitor there’s no sophisticated electronics, EQ switches or even input options to describe on the Two15. Its rear panel, however, is home to a feature not often seen on either pro monitors or hi-fi speaker these days; namely a pair of auxiliary bass radiators (ABR for short). An ABR was a relatively common sight on hi-fi speakers back in the 1970s and 1980s, however in more recent decades the technique has rather fallen out of favour. Fundamentally, an ABR serves the same function, and works in the same way, as a reflex port. As frequency falls and a speaker’s frequency response reaches its low-frequency cutoff point (defined primarily by the fundamental resonance frequency of the driver, and the air volume of the enclosure), an ABR or reflex port adds a sympathetic resonance that effectively reverses the phase of the rear output of the driver to provide a low-frequency bandwidth extending boost. You don’t get something for nothing of course, and the downsides can include degraded time-domain response (phase reversal implies a time delay of at least the inverse of frequency), and potentially various level-dependent compression, turbulence and distortion effects. A reflex port provides resonance through the mass of air in the port moving as one and ‘bouncing’ against the springiness of the bulk of air in the enclosure (this is a simple Helmholtz resonance). An ABR, however, is simply a driver without a voice coil or magnet, and the resonance is provided by the mass of its diaphragm working against the compliance of its suspension and, again, the compliance of the air in the enclosure. Tuning a reflex port to the frequency required by the desired low-frequency response is achieved by adjusting its length and diameter, while the equivalent procedure with an ABR is to adjust its suspension compliance, diaphragm mass or diaphragm area. So, reflex ports and ABRs are closely related beasts. However, there is, I think, a good argument or two in favour of the ABR. Firstly, reflex ports can be surprisingly non-linear once they start to work hard. As volume level rises and the air in a port is required to move further and faster it quickly becomes turbulent. When this happens not only can the port start to make that characteristic ‘chuffing’ noise, it will also stop working effectively. A reflex port relies upon the air it encloses moving as a whole, and once that is no longer the case the resonant frequency will change and the port output will decay. This is why generous and thoughtful entry and exit profiling of port tubes is vital. An ABR, however, if carefully designed with sufficient cone movement and suitably linear suspension, is less likely to suffer from these kind of problems. It is also more practical to tune an ABR to a low frequency than it is a reflex port — especially in the case of relatively small speakers. To tune a reflex port to a lower frequency, either or both its length has to increase or its diameter has to decrease. Decreasing the diameter, however, will reduce the volume level at which airflow becomes turbulent, and increasing the length may simply be impractical in a small enclosure. To tune an ABR to a lower frequency simply requires the addition of mass to the diaphragm. Furthermore, along with their intended Helmholtz resonance, reflex port tubes can also suffer from a high-Q pipe resonance, often at a frequency well into the hundreds of Hertz and sometimes at a peak level that approaches that of the driver output. ABRs, in contrast, fundamentally lack the mechanism necessary to create such a resonance. And ABR disadvantages? Well, cost and complexity are probably the primary reasons why ABRs are not seen more often. Even without a magnet and voice coil, an ABR is still an expensive component in comparison to a reflex port. Developing a successful ABR system is also significantly more complex than is tuning a reflex port. There are more variables with an ABR, so more development trial and error is likely to be necessary, and the physical demands of incorporating an ABR into a speaker enclosure design and aesthetic are likely to be more complex (especially on active speakers where the rear panel is already likely to be busy). The Amphion Two15’s use of a pair of ABRs probably doesn’t convey any significant advantage or disadvantage over a single unit of the same diaphragm area. It simply reflects the tall and slim proportions of the MTM enclosure. Along with those tall and slim proportions, the other notable feature of the Two15 is its white moulded Corian tweeter horn. 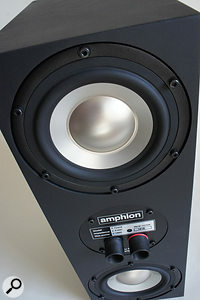 That tweeter horn is key to the design principles of all the Amphion monitors and it offers a neat approach to one of the fundamental compromises of any two-way speaker design: the conflict between consistent dispersion through the crossover region (typically between 2 and 4 kHz) and the power handling and distortion performance of the tweeter. This compromise occurs primarily because, while the dispersion of even relatively small bass/mid drivers begins to narrow as frequency rises above 1kHz or so, the dispersion of a typical ‘naked’ 25mm-diameter HF driver will be pretty wide at the lower end of its range — typically around 3kHz. So in a conventional two-way speaker there is often a discontinuity in dispersion as the bass/mid driver hands over to the HF driver. Clearly, a potential way of solving this problem would be to lower the crossover frequency to a point where the dispersion of the bass/mid drivers has not significantly narrowed. However, doing so will then most likely ask too much of the HF driver in terms of diaphragm movement and power handling, so it’s not usually a great idea. The solution provided by the Amphion HF driver horn is two-pronged: firstly, it narrows the dispersion of the HF driver at the lower end of its band, and secondly it significantly increases the driver’s radiation efficiency so a lower crossover frequency (1.6kHz) becomes feasible. It’s a neat bit of electro-acoustic engineering. As well as housing the amplifier connection posts, the rear of the Two15 also plays host to two auxiliary bass radiators.I’ve so far rather glossed over the fact that the Amphion Two15 is a passive monitor and requires an external power amplifier. I can’t ignore the issue forever, however I do wonder if, in reality, it’s such a big deal for many potential customers. When I wrote about the One15 and One18 back in 2015, I felt perhaps their passive nature would hold them back in a monitor market so dominated by active speakers. 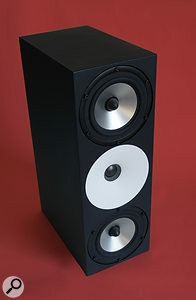 It seems not, however, because from the reports I’ve heard, the Amphion range has been notably popular in recent times. This presumably means that, despite the apparently unstoppable march of active monitoring, either many studios are still home to a suitable power amplifier or Amphion customers have been persuaded by the quality of the speakers to invest in one. Speaking of investing in amplification, there are numerous quality power amps out there that could potentially do a very good job driving the Two15. For what it’s worth, I used my usual Naim SuperNait hi-fi integrated amp, but a more conventional pro-audio choice might be one of Amphion’s own power amps, or perhaps a product by Bryston, or even Lab Gruppen. There’s no avoiding the fact that if you don’t already own suitable amplification, a budget perhaps in the order of the cost of the monitors themselves ought to be earmarked for it. That’s not to say that a pair of Amphion Two15s won’t basically work when connected to that ancient Japanese hi-fi amp unused in a cupboard for a couple of decades, but they probably won’t then show their full potential. So how did the Amphion Two15 stack up in use? Well, firstly, as expected from its driver format and the FuzzMeasure frequency response curves, it did indeed sound significantly different when used in landscape or portrait orientation either side of my DAW. In portrait orientation its stereo image performance, in particular, was more focussed and the manner in which it presented different strands and components of a mix was more detailed. In landscape orientation, both these aspects of the Two15’s subjective performance were, to my ears, less explicit. I’ve little doubt that if I were to finish a mix with landscape monitors and then switch to portrait, I’d find the mix would need some tweaks. My strong suspicion, as I described in the PreSonus review, is that the suppressed vertical off-axis output through the mid-range when in portrait orientation results in a reduced first reflection from the workstation desk. I also suspect that in a different room acoustic — maybe a work space without a big desk but with side walls closer to the monitors — landscape orientation might be more appropriate. So the MTM format, once again, shows itself to have some benefits in nearfield monitoring, but what more generally of the subjective performance of the Two15? I remember with the One15 and One18 that I was particularly struck by how easily I found I could work with them and have confidence that what I was hearing genuinely reflected what was playing. There was very little adjustment necessary from my regular KEF LS50 nearfield monitoring. I found the same with the Two15. In terms of overall tonal balance they absolutely nail ‘neutral’, but their quality is also founded on very low levels of distortion and coloration. The only fault I could find was an occasional hint of extra warmth on male voices (it was occasional though, and very much just a hint). Perhaps the relatively large cabinet side panels play along with the music just a little. The Two15 doesn’t offer the most extended LF bandwidth in comparison to many nearfield monitors of a similar size, especially those incorporating healthy levels of active LF EQ, but its twin-ABR bass is a success nonetheless. It sounds far closer to a closed-box speaker in character than the vast majority of reflex-loaded monitors. As a bass player, one of the first things I listen for is low-frequency timing, pitch and dynamics and, even in the context that the Two15 is a relatively small monitor, I had no complaints. I’ll always be a fan of closed-box speakers at heart, but on the strength of this Amphion implementation of the ABR technique, there’s much going for it. I liked and admired the One15 and One18 back in 2015 and my reaction to the Two15 is no different. It’s a genuinely classy monitor created through thoughtful and clever electro-acoustic engineering, and if you already own a suitable power amplifier or are happy to invest in one I can think of no arguments against it. Passive monitors at around the price of the Amphion Two12 are relatively thin on the ground, although ATC, PMC and Harbeth, for example, all have models in the same kind of ballpark. Adding a £1000 amplifier budget to the price of the Two15 brings active models from many of the usual suspects into play, such as the ATC SCM20ASL, the Genelec 8351A, the Focal SM9, the PSI A21M and the Unity Audio Super Rock MkII. Basically, while D’Appolito in his AES paper analysed the MTM format with a variety of crossover types (and showed that the detail of the dispersion lobing varies), he didn’t mean to imply that only those specific crossover types were viable in MTM format. It’s really just the basic geometry that’s important. So the Amphion Two15, while perhaps not incorporating any of the crossover characteristics that D’Appolito described in his AES paper, can still (I think) be described as a D’Appolito-format speaker. Please feel free to disagree, however, or perhaps worry about something that is genuinely important! It seems self-evident in this age of almost exclusively active monitoring that active must be better than passive and, in theory (and in a perfect world) I wouldn’t disagree. But, of course, theory is one thing and practice is another, and it probably will not have escaped your notice that we don’t live in a perfect world. It’s also unavoidably the case that the Amphion monitors are passive and that they work extremely well. So, I thought a quick, real-world look at some of the pros and cons of active over passive might be enlightening. Enables more accurate and sophisticated crossover filter topologies to be used. Fine-detail response equalisation (rather than broad-brush) is feasible. 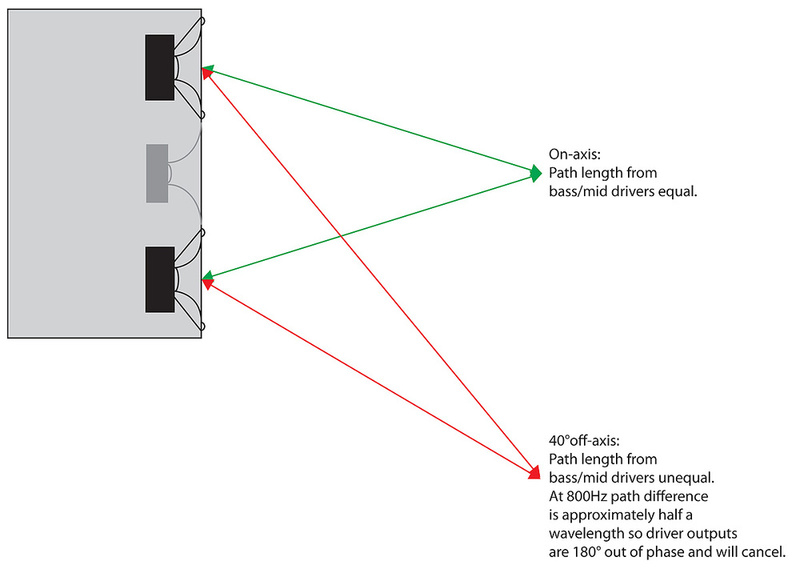 Direct-coupled connection between amplifiers and drivers means better diaphragm control. Amplifiers and drivers can be electronically matched or even designed holistically using feedback or current-drive techniques to reduce distortion (unfortunately this rarely happens). Filter errors due to driver thermal effects are eradicated. Significant potential for amplifier electronics to be affected by vibration — especially if the amp shares an enclosure with the bass/mid driver (this is often the case, especially in lower-priced monitors). Driver and enclosure quality is at the mercy of the amplifier budget. Amplifier design and performance is an unknown quantity from the user’s point of view. No possibility of performance improvement through better amplification. Tendency for electro-acoustic design to play second fiddle to electronics. Detail, clarity and neutral tonal balance. Great bass performance with no sign of time-domain issues. Quality manufacturing and classy looks. A capable, high-performance power amplifier is obligatory! The Amphion Two15 offers all that you can really ask of a monitor at its price level. It’s tonally neutral, and has satisfying, honest bass, great stereo and a good level of wide-band detail. The MTM format also potentially offers a degree of installation versatility. £3149 per pair including VAT.